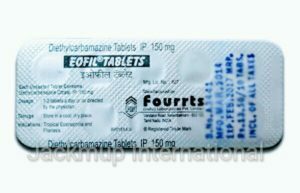 Description:- Eofil 150 mg tablet is used in the treatment of parasitic worm infections and filariasis. It belongs to a class of medication called anti-helminthic. It can act against both the larval and adult forms of the parasitic worms that cause filariasis. Common Side effects: Headache, Dizziness, Vomiting, Abnormal liver function tests, Nausea, Abdominal pain, Hair loss, Fever, Vertigo.